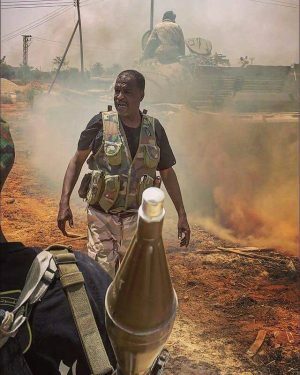 The camp in Benghazi’s Ganfouda district used by Libya Shield No. 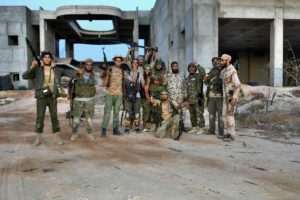 1 as its headquarters today fell to the Libyan National Army’s 302 and 308 brigades. It is the latest in a number of gains by the LNA as it mops up remaining centres of opposition held by Islamist insurgents. Other gains over the past 24 hours in Ganfouda and Gwarsha include the Al-Jouadi residential village in Ganfouda, the half-finished housing estate in Garyounis/Gwarsha that was being built by the China State Construction Engineering Corporation (CSCEC) prior to the revolution, the compound of a Turkish company in Gwarsha, the Al-Jouf company in Ganfouda and the fertility treatment centre in Gwarsha. Today also saw more strikes by LNA MiG fighters in Ganfouda. They continued after sunset. According to the LNA, many fighters from the so-called Islamic State (IS) were killed during the day, However, no numbers have been given. The LNA designates all those it is fighting as “IS”, although many are from other Islamist forces.